← My Alma Mater – The American School, Inc. The year was 1960, my dad had passed away the preceding year and my mom continued to manage our jewelry store, the Gem Gift Shop, on the Escolta. She was an ambitious entrepreneur. Realizing that the halcyon days of the Escolta were numbered, she decided to establish branches of our store in different locations. My mom, Carlota, in front of our store Gem Gift Shop on the Escolta. 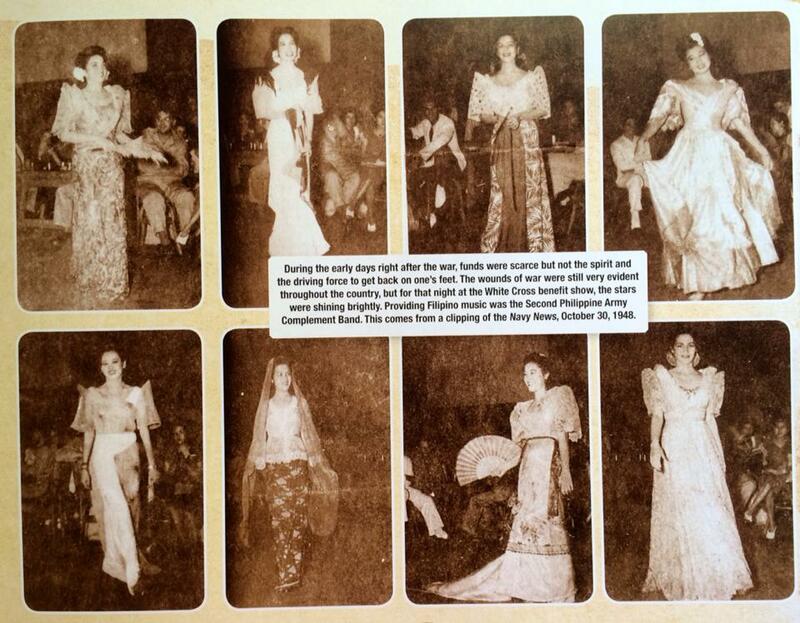 She opened stores on Mabini, in Cubao and within the lobbies of the Bayview and Manila Hotels. Now 16, I had the use of our family car. I would drive to school, then in the late afternoon would park out on Katigbak Dr. in front of the Manila Hotel to bring her back home in the evening. Sometimes I would bring my swimsuit and sneak into the pool area, which was reserved for guests of course. It made me feel somewhat privileged … like I was somebody. There was something about that hotel, catering to the elite that exuded… magic. Years later, in 2004, Michelle and I made a balikbayan trip back to Manila after over 50 years to film scenes for our documentary “Victims of Circumstance”. I insisted we stay at the Manila Hotel to enjoy its service and history. It seemed a bit run down, like an older spinster aunt trying to keep up appearances, but I was not disappointed. 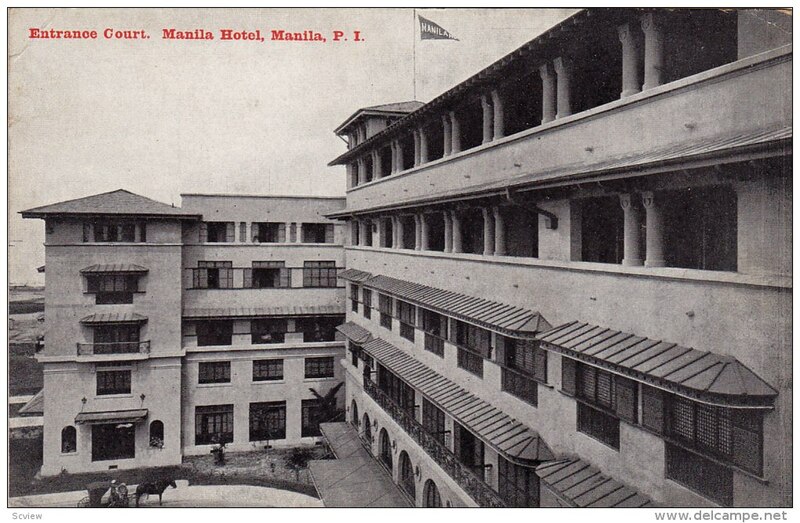 There is much to write about the Manila Hotel and much has already been written in great detail. This article is not meant to be a thorough dissertation but glimpses captured from the timeline of its over 100 year history. I hope you’ll indulge me and enjoy this article. Oh by the way, there’s our 55 Chevy parked out in front. Check out my photos of our visit to the Manila Hotel in 2004 at the end of this article. 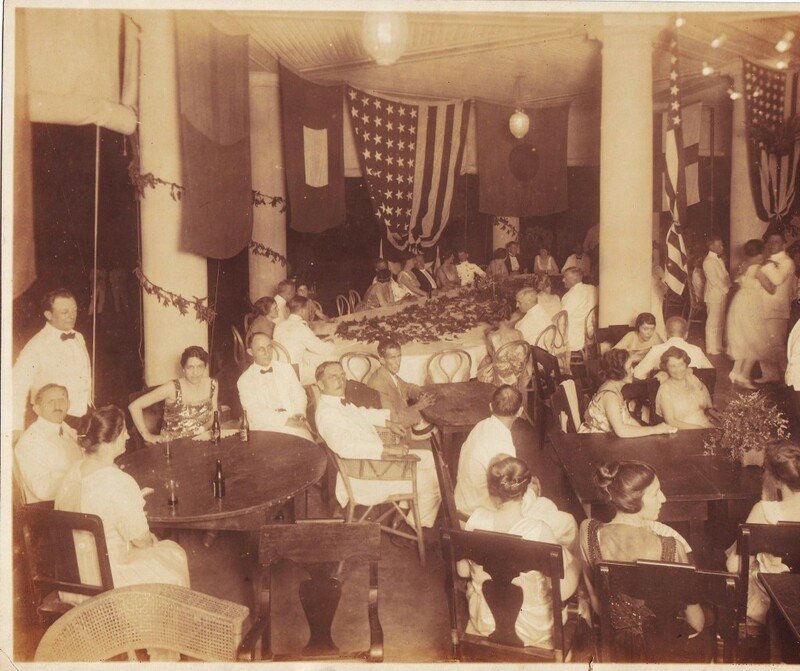 At the turn of the 20th century, Manila was a busy hub of newly arrived American and European businessmen eager for the opportunities this country offered but accommodations were lacking. There were several larger and older hotels such as the Hotel Oriente, the Delmonico, the Metropole and the Bayview but they could not be classified as “first class hotels” by any means. This was the original Bayview hotel on 13-29 Calle Alhambra. It would later be torn down with the widening of Dewey Boulevard. Realtor Harry Kneedler rebuilt the new Bayview in the 1930s. The older hotels were located at sites not immediately accessible; hidden away within the Intramuros or in the Binondo area, and the food and service were mediocre at best. 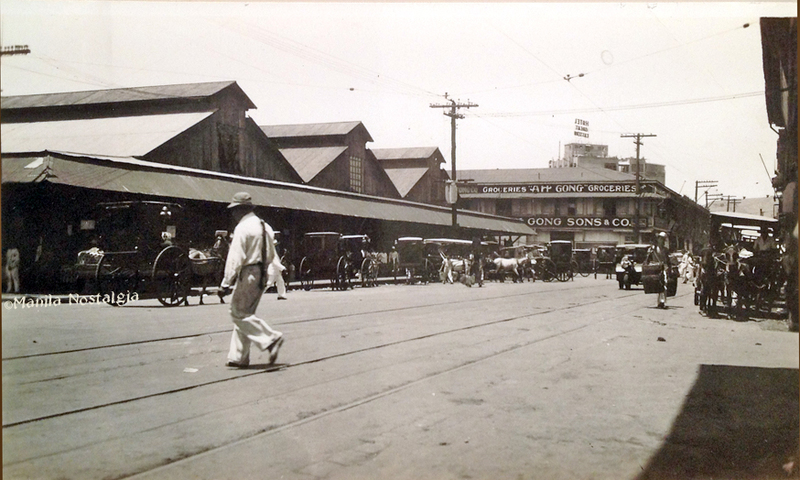 The Hotel Oriente was owned and managed by Ah Gong, a food provider whose warehouse was next to the Quinta market. The Philippine Commission brought over architect Daniel Burnham to “beautify” the city. His plan was magnificent as it transformed the old mosquito ridden and water-filled moats around the Intramuros into a sunken gardens and public golf course. 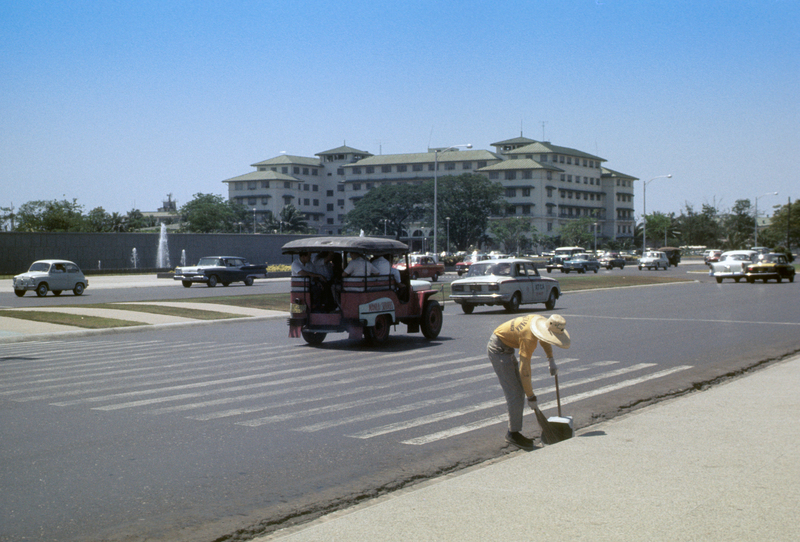 These rare photos shows what the Luneta looked like before the landfill extension. 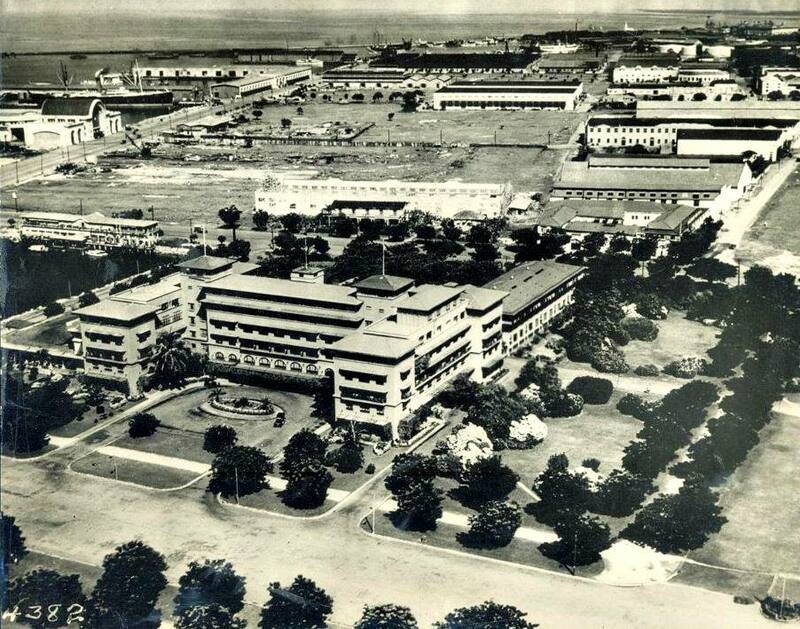 The harbor was dredged and millions of tons of mud and sand were used to reclaim and extend the Luneta, making room for the Elks Club, the Army Navy Club and a site for a first class hotel to be called the Manila Hotel. The location was perfect as it was next to Pier 7, where it was now possible to berth four large passenger ships at once and visitors could find a room just a short calesa ride away. 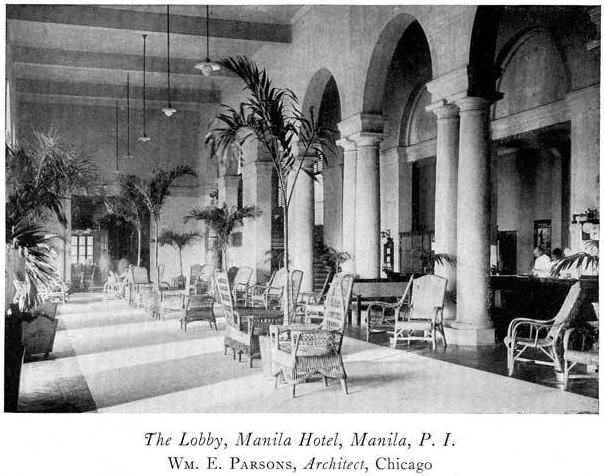 Burnham commissioned American architect William Parsons to design the Manila Hotel as well as many buildings which still stand today: the Elks Club, Army and Navy Club (barely standing), PGH, Paco Railroad station, and the Paco Market. Architect Parsons selected a “California Mission” style for the new hotel, essentially a large, white-washed concrete house with a deeply pitched, cool green tile roof. A circular rotunda led up to the main entrance and portico. Framed by graceful twin Doric columns of white plaster and arches, the lobby had double grand stairways which led to the mezzanine floor that included a music room, guests’ parlor, and children’s dining room (a Victorian convenience which greatly added to the adults’ leisurely dining). Newly built, the Manila Hotel in 1913 framed against Manila harbor. The Men’s Loggia at the front of the building was a favorite lounging room for smokers as it gave a view of the Bay and the incoming visitors. At the back was the bar, cigar counter, haberdashery, and grill room. The main dining room reached from the left end of the lobby, swept in large semi-circle out toward the bay so that each guest could dine with an uninterrupted view of the strikingly vivid sunsets of Manila Bay. It was a five-story building with 149 guest rooms which began on the second floor, half of them having their own private bath, an unheard of luxury for that day. There were telephones in every room, push-button room service and the first intercom system installed in Asia. No air conditioning was available as yet so the guests relied on ceiling fans and open windows for ventilation. 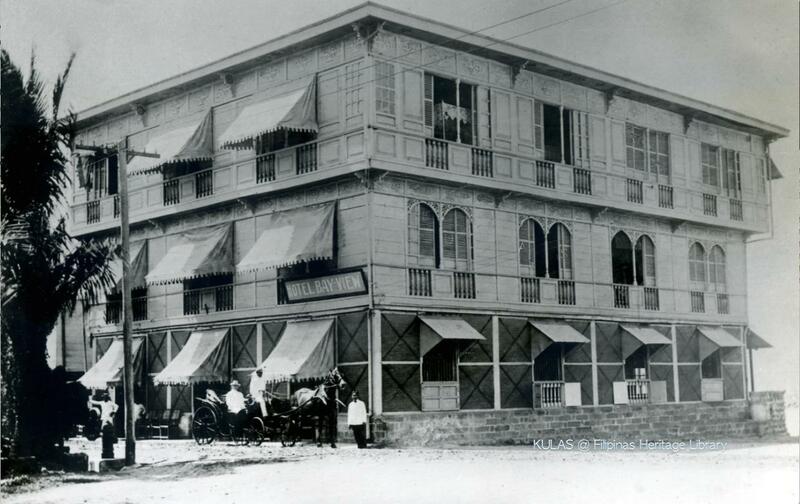 The hotel was so popular, an annex designed by Andres Luna de San Pedro, was later built on the bayside to accommodate an additional 80 guests. To provide a pleasant spot to collect the cooler breezes wafting from the bay and perhaps to enjoy a music program offered at the Luneta grandstand every evening, Parsons designed a roof garden. 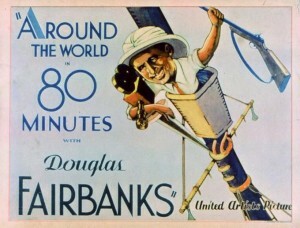 1931 was a changing point in the lives of director Victor Fleming and actor Douglas Fairbanks Sr. While the golden years of the director were yet to come, the ultimate star of the silent movie era was facing the rapid decline of his career with the advent of the talking pictures. 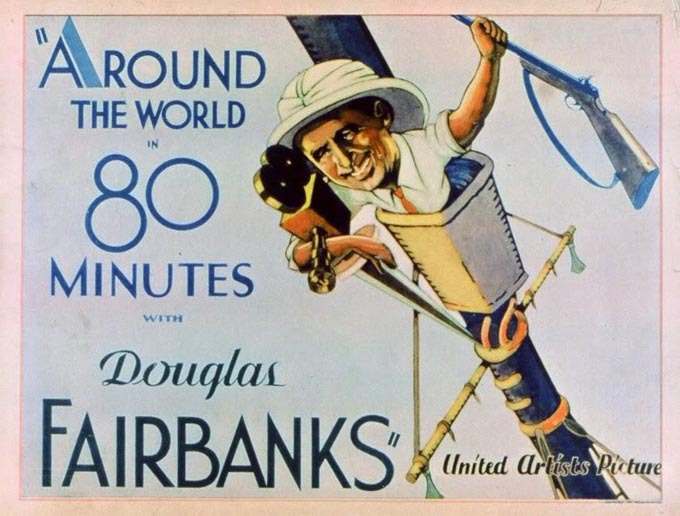 Fairbanks decided to produce a documentary titled “Around the World in 80 Minutes” as a desperate escape from Hollywood and a disloyal cinema audience. Many of the hotel staff sneaked down to the lobby to see the famous actor and he did not disappoint. Flashing his famous toothy smile, he waved at his audience and vaulted over the staircase with one hand. While Fairbanks was staying at the hotel the management had to station several policemen at the lobby entrance to hold back the crowds. In the golden days of the 1930s, Manila was as gay and almost as star-studded as Hollywood; its social life was on a stupendous and colossal scale that resembled nothing more than a motion picture set. Celebrities of all shades – in saris, kimonos, satins, fez and regimentals strolled through the lobby of the famed Manila Hotel. 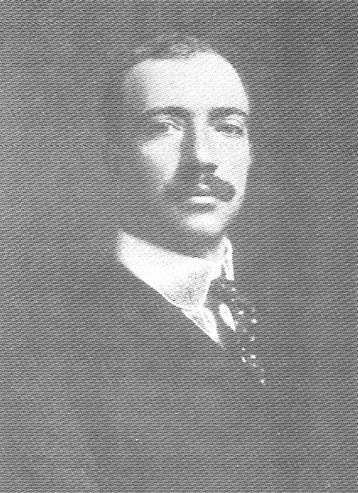 The Kahirup organization, founded by Dr. Manuel Hechanova in 1923, was a social group of sugar barons whose aim was to bond with people of similar elite status. 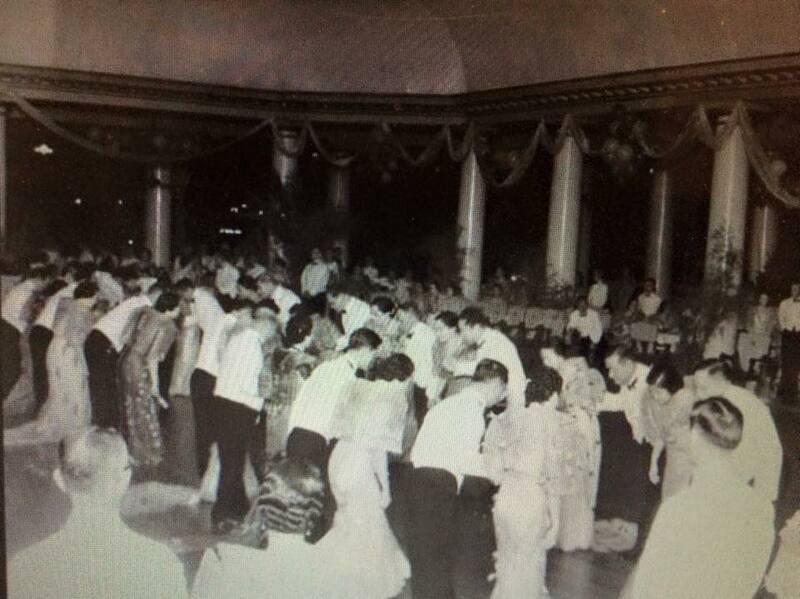 They held an annual ball, typically at Manila Hotel’s Fiesta Pavilion or Winter Garden. It was the highlight of the social season with a fashion show and opened with a Spanish ceremonial dance, the rigodon de honor, featuring high society ladies glittering in their jewels and uniquely beautiful, specially designed, ternos. The rigodon was a delight to watch. It was stately and elegant as a minuet, basically a square dance, danced to the rhythm of a military march. One of the more colorful characters to emerge from the long history of this hotel was Walter E. Antrim who showed up in Manila in the early 1920s and snagged a job as a dishwasher. By 1926, he had been elevated to Manager of the hotel. 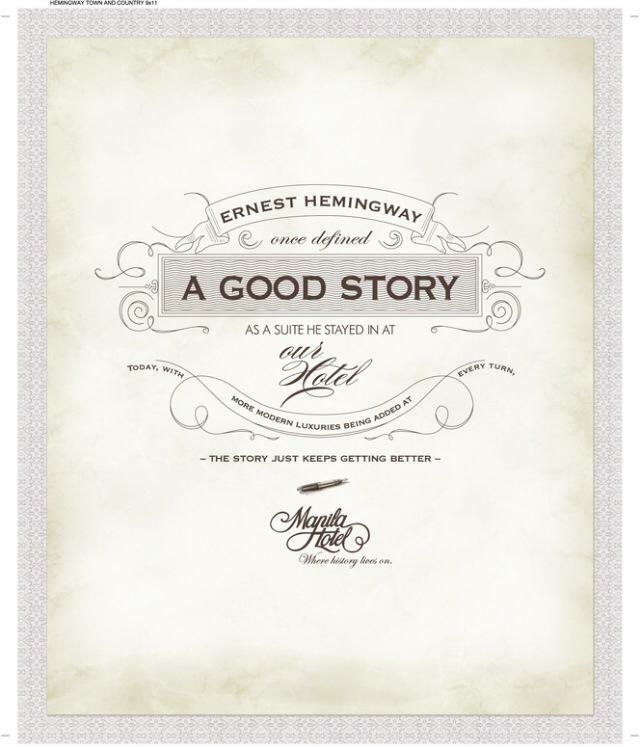 “Monk” Antrim knew how to live life in his own way: high, wide, and handsome, making many friends as he went along. 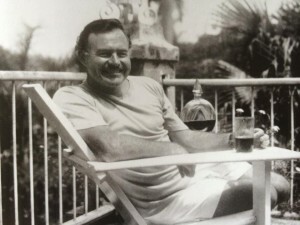 He vanished several years later but left his legacy, the “Monk Antrim Lintik Cocktail”. The Lintik drew its name from the Tagalog word for Lightning. It had to be aged for two weeks then chilled in an ice bucket without coming into contact with ice. Antrim married and left Manila suddenly. One can only imagine due to some mysterious reason. He ended up in Mexico and passed into oblivion. 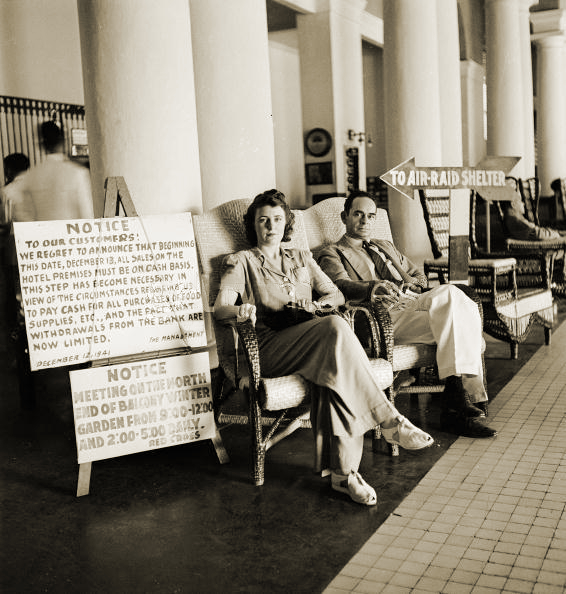 Of course the most famous visitor to this hotel was Gen. Douglas MacArthur. 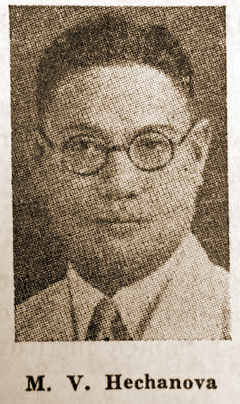 First coming to Manila in 1903 to oversee the construction of fortifications and harbors, he had met a young Manuel Quezon, a lawyer already active in national leadership. The two hit it off and began to have a lifelong friendship. The general returned to Manila in 1928 for two years’ duty, he found his friend Quezon was now a dominant political leader. 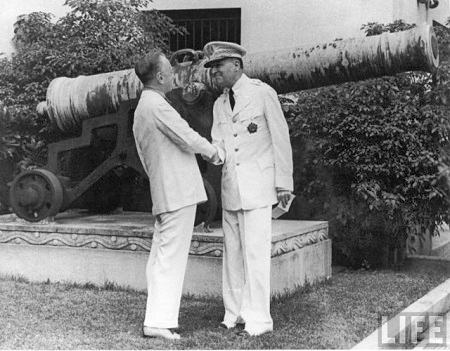 After Quezon became president of the Commonweath, he asked MacArthur to take charge of a defensive force as Military Adviser in the Philippines. President Roosevelt, eager to get rid of the troublesome MacArthur, agreed. 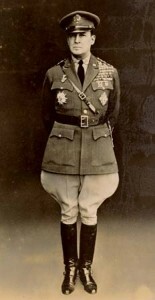 The General established himself to the rank of field marshall, the only U.S. Army office to hold that grade and demanded ₱33,000 salary a year (the same salary and allowances of the High Commissioner of the Philippines) and accommodations to equal Malacañang: seven bedrooms, a special study, and a state-sized dining room. He also required his personal physician, Capt. Hutter and his wife Callie, live in the hotel as well. Quezon commissioned architect Andres Luna de San Pedro to find suitable digs for the general. 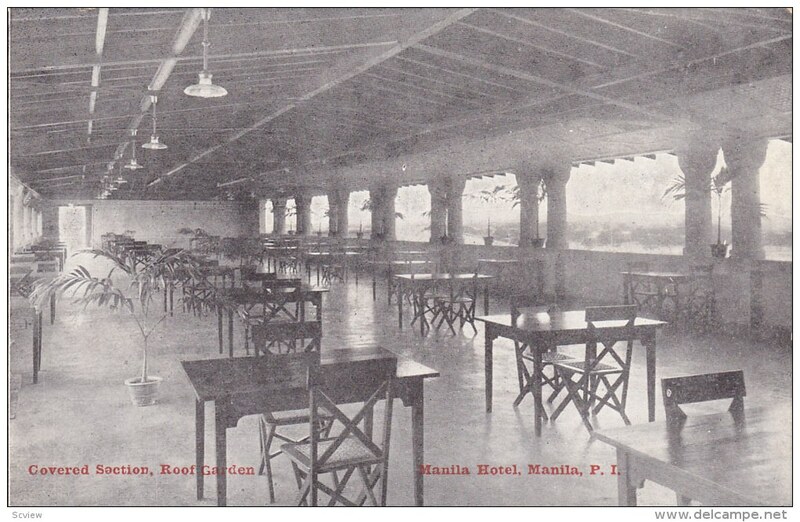 It was Luna who came up with a solution, “I have looked over the Manila Hotel and I think that if we build a penthouse over the entire top floor of the hotel, we would be able to provide all the rooms and accommodation which the General specified.” The roof garden was turned into a sixth floor with a fully air-conditioned penthouse. In order to justify its extravagant rental expense Quezon’s aide, Jose Vargas suggested appointing MacArthur Chairman of the Board and President of the Manila Hotel Corporation. The penthouse had as much floor space as the entire floor below, containing the seven bedrooms plus a study, music room and formal dining room. The entire floor was fully air-conditioned and fully carpeted, even rivaling the presidential palace. The remodeling was completed in 1937. The photo below shows the 6th floor addition along with the new annex on the bayside. General MacArthur referred to his brief years spent at the beautiful penthouse with his wife Jean and son Arthur, as one of the two real homes of his entire life. Along with MacArthur came his aide and future president, Lt.Col. Dwight Eisenhower and his wife Mamie and son John. It was a contentious relationship at best. Eisenhower said, “Yes, I studied dramatics under him for five years in Washington and four years in the Philippines.” The Eisenhowers finally left Manila in December 12, 1939 – just two years to the date before Manila was attacked. 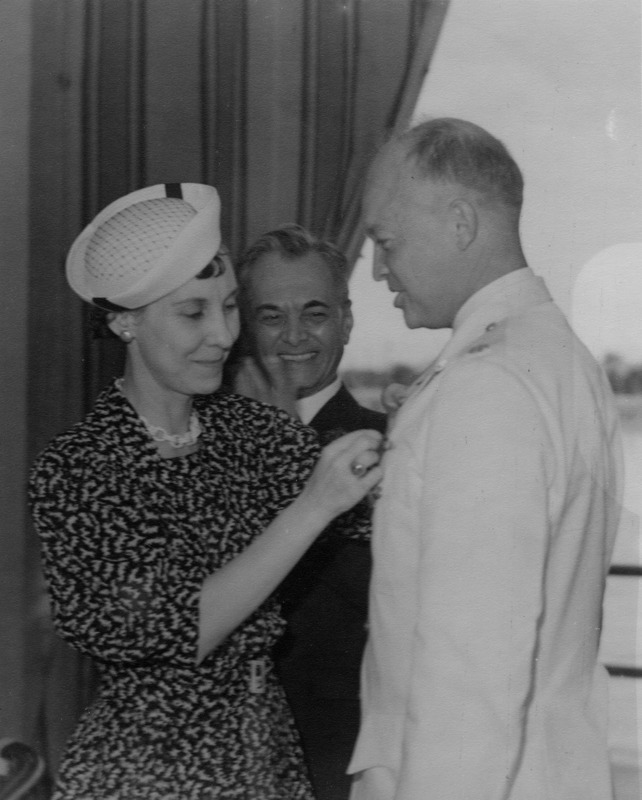 Eisenhower pinned by Mamie as Quezon looks on-1939. Discrimination was a part of the American colonial period. 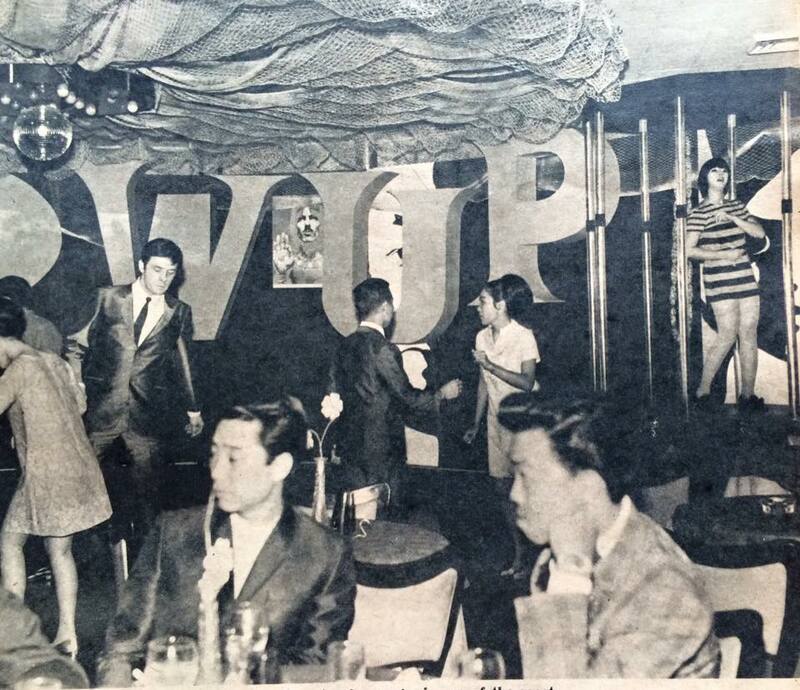 It existed in clubs like the Army and Navy and Polo Clubs, at cabarets like the Lerma Cabaret and even in the hotels, such as the Manila Hotel. As more and more Filipinos felt comfortable patronizing the Manila Hotel, even the menus offered at the restaurants changed accordingly. 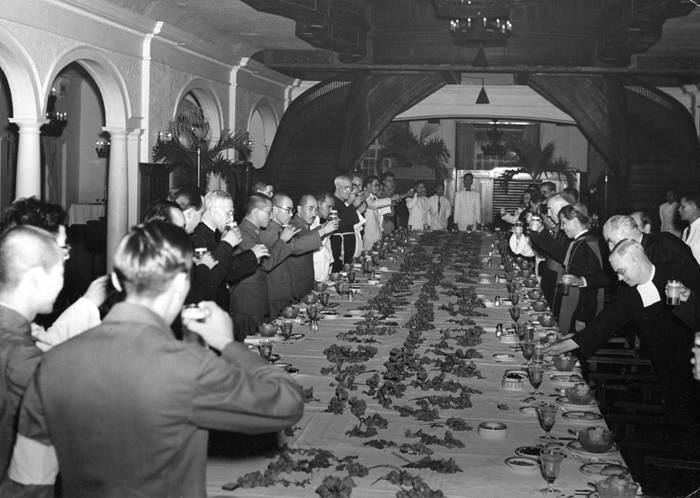 From a purely American fare, the food was now an eclectic offering of Filipino specialties such as adobo and pansit to Quezon’s favorite: the Spanish lengua estofada. 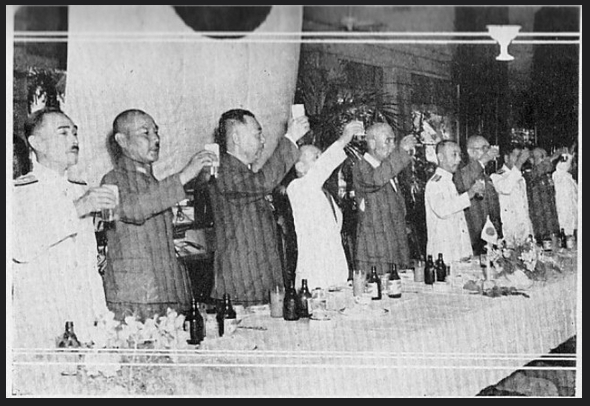 Two major events happened in 1935 that were closely tied with the Manila Hotel. On November 15, 1935, the country began as a new Commonwealth of the United States with Manuel Quezon being sworn in as president. 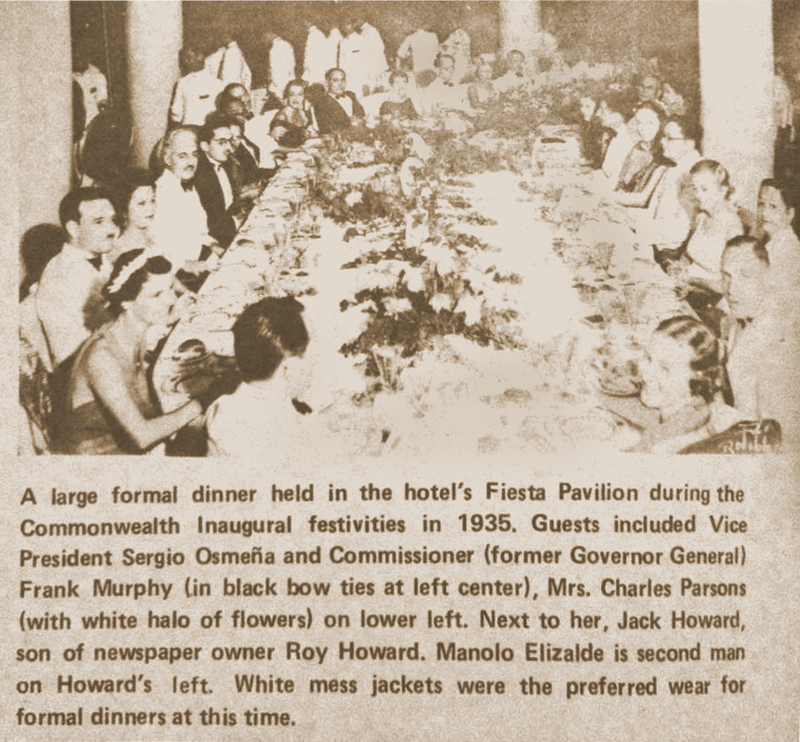 There were too many guests to fit into either the Manila Hotel ballroom or Malacañang Palace so the inaugural ball was held in the giant auditorium at Manila’s city fairgrounds. However from that point on, official and semi-official functions of the new Commonwealth government were either held at the Malacañang or the Manila Hotel. The second event was the inaugural flight of PanAm’s Clipper arrival in Manila Bay on November 29, 1935. 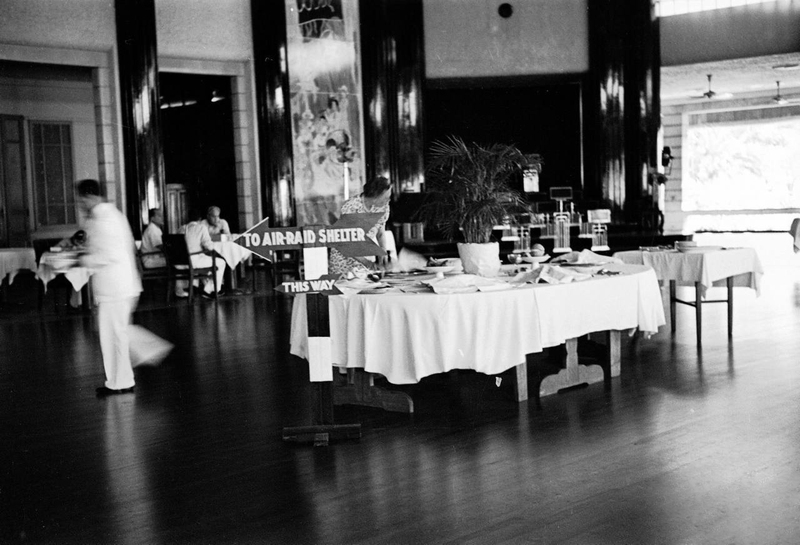 The Manila Hotel lobby was the PanAm office where passengers would make reservations and drop off their luggage for the launch out to the Clipper, moored at Canacao Bay, Cavite. My dear friend, Doug Willard , who worked for PanAm, did double duty as he made reservations, checked in luggage and helped the passengers aboard the Clipper. 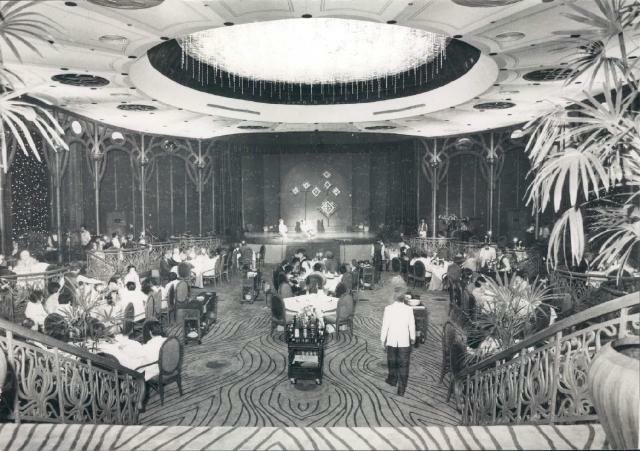 When the roof garden was converted into MacArthur’s penthouse floor, the main floor dining room was expanded to a full-scale supper club, the Fiesta Pavilion with the entire center area devoted to a dance floor. It was called “the most attractive dining and dancing resort in the entire Far East”. As the war in Europe raged, storm clouds gathered over the Pacific Rim. Japan continued its onslaught throughout China and Korea and was headed south towards Hong Kong and the Philippines. 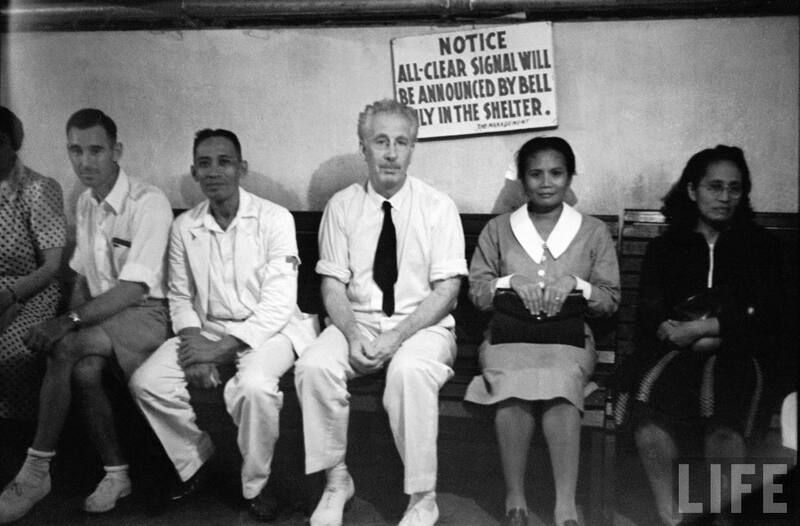 In Manila, blackouts and air raid alerts were common place activities. 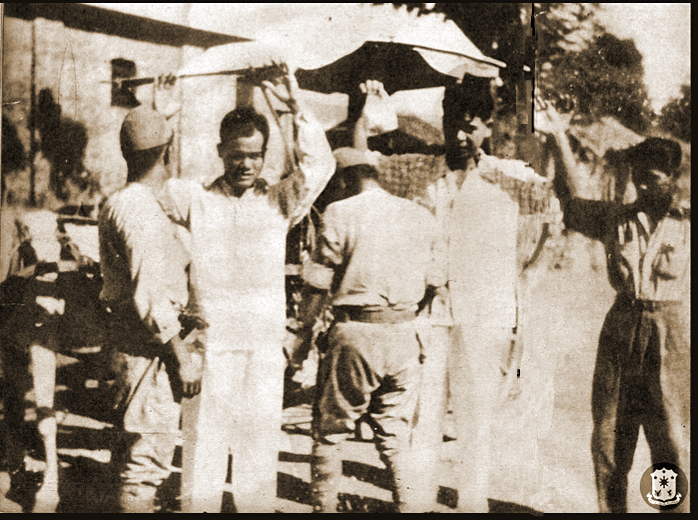 Japanese and even German civilians were interned at Bilibid for two weeks. Guests at the hotel took it all in with a certain laissez-faire. As Gen. MacArthur was having breakfast in his suite on Sunday July 27, 1941, he received a cable from President Roosevelt recalling the general back to active service. Five months later on December 8th, Manila was attacked by the Japanese and the rest is history. 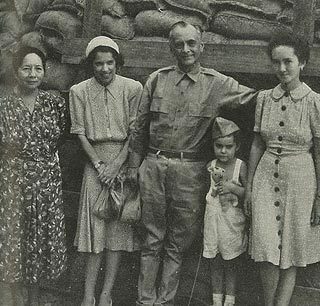 Below, Aurora A. Quezon, Jean Faircloth MacArthur, Manuel L. Quezon, Arthur MacArthur and Maria Aurora Quezon, during a reprieve in the daily bombardment on the island fortress of Corregidor, 1942. MacArthur, Quezon, Romulo and others retreated back to Corregidor and left for Australia as defeat was imminent, leaving Jose Laurel, Jorge Vargas and his remaining administration left to manage a puppet government set up by the occupying Japanese forces. In order to save the city from destruction, Pres. Quezon declared Manila an “open city” on December 26, 1941. 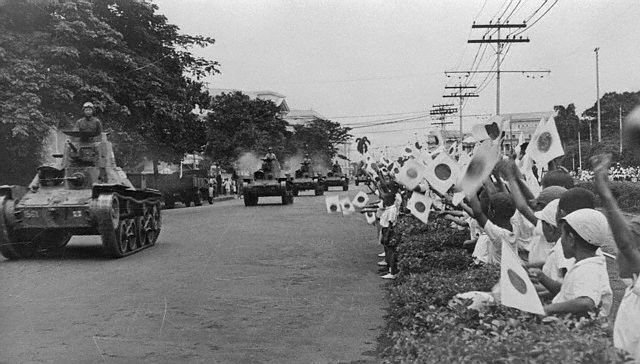 The Japanese entered Manila on Jan 2, 1942. After a brief period of high anxiety, life seemed to settle back to normal. In order to cut the Filipinos off from Western – American influences and remold them to the new order, the Japanese controlled all forms of media: newspapers, radio and even typewriters and mimeograph machines had to be registered. The Japanese established very strict rules and discipline regarding civilian registration and criminal activity but for the most part, the Filipino with his bahala na (go along) attitude went along with the prevailing winds of the Co-Prosperity Sphere touted by the occupying force, secretly hoping for a miracle rescue by the United States. The American and British guests at the hotel were ordered to pack one suitcase and enough food for 3 days and to leave their other belonging at the hotel. On January 4th, they were rounded up and sent to the University of Santo Tomas for internment. An arrangement was made to store their bags until they could later be returned to their owners. 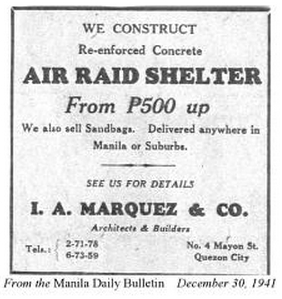 However, in September when the bags were to be retrieved, the Manila Hotel (now under the management of the Military Administration) demanded payment for outstanding accounts at full rates from the time the rooms were vacated on January 2nd until the internees were taken to Santo Tomas on the 7th. Hotel Manager Mendoza replied that there was little he could do as he was only carrying out his orders. The Manila Hotel guests were lucky to receive their belongings mostly intact where luggage from other hotels had mysteriously disappeared. Japanese soldiers pose with flags. The Japanese Military Administration took possession of the Manila Hotel converting it into a military headquarters for high-ranking officers. MacArthur’s lavish penthouse was used for visiting dignitaries from Tokyo, notably General Yamashita and Prime Minister Tojo, who stayed at the MacArthur suite in May 1942. 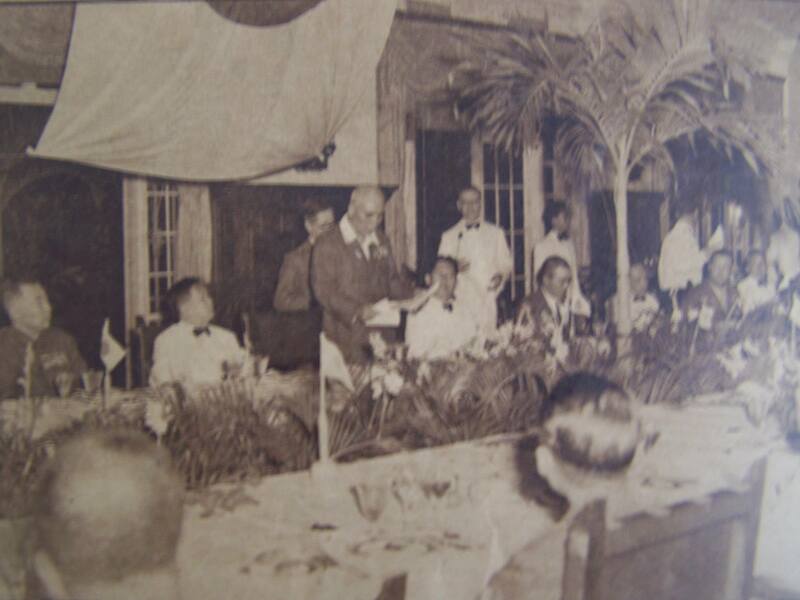 Japanese toast Gen. Homma at a banquet in the Manila Hotel. It was strange to see the Japanese flags flown at the hotel entrance and other buildings such as the former High Commissioner’s Office. The Filipino staff were ordered to stay on duty and were all forced to learn Japanese. The Chinese chefs were instructed to prepare only Japanese food for the new tenants. 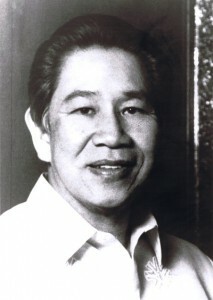 The former manager, Howard Cavender had been called to active duty and his assistant, Francisco Mendoza, took over as acting manager – the first Filipino in that capacity. 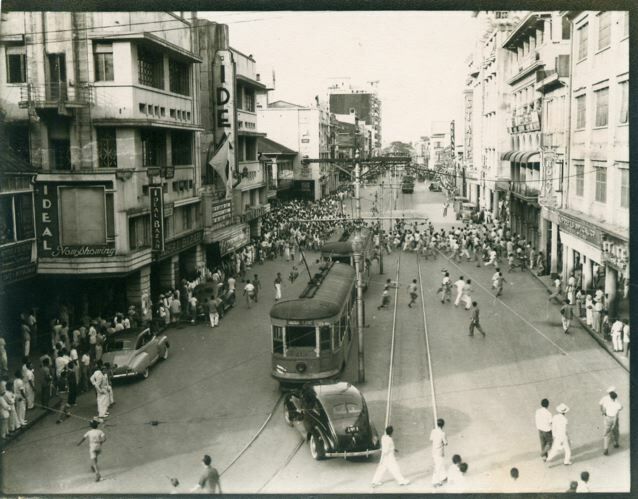 Only a year after the Japanese entered Manila, the once so beautiful city was only a shell of its old self; the streets were dirty and full of holes; only an occasional automobile was to be seen; thousands of unemployed listlessly walked the streets, many of them in rags; small peddlers, offering all kinds of odds and ends for sale, crowded the sidewalks; there were thousands of beggars. Many of the shops had been turned into cafes and saloons for the Japanese soldiers. Downtown and in the best residence sections as well, whole blocks of houses and apartments were now brothels. 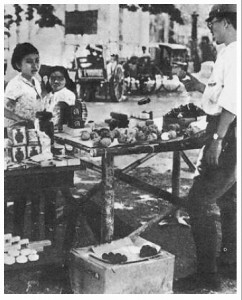 Japanese soldier shopping at a vendor’s stall. As the war continued on thru 1944, food was getting increasingly hard to find. Unlike the American forces that brought arms and food to the battle zones, the Japanese forces relied on resources from the occupied countries; everything was confiscated: autos, gas, food, and the Filipino’s basic staple, rice. Manila’s Mayor Guinto “asked” people to refrain from eating meat at least 3 or 4 days a week. As food grew scarce, the prices skyrocketed. Charcoal was selling for ₱8 ($4) a sack, a spoonful of sugar cost 20 centavos, and rice, now only available on the black market, was selling for ₱70 a sack. Although I can’t imagine the hotel’s chefs had much of a problem provisioning their kitchens with the high priority status for the army and navy officers and guests. 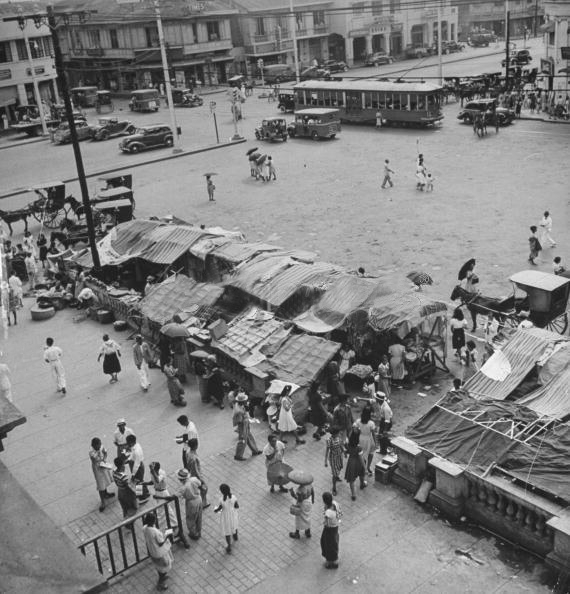 Vendor stalls by Quiapo Church. 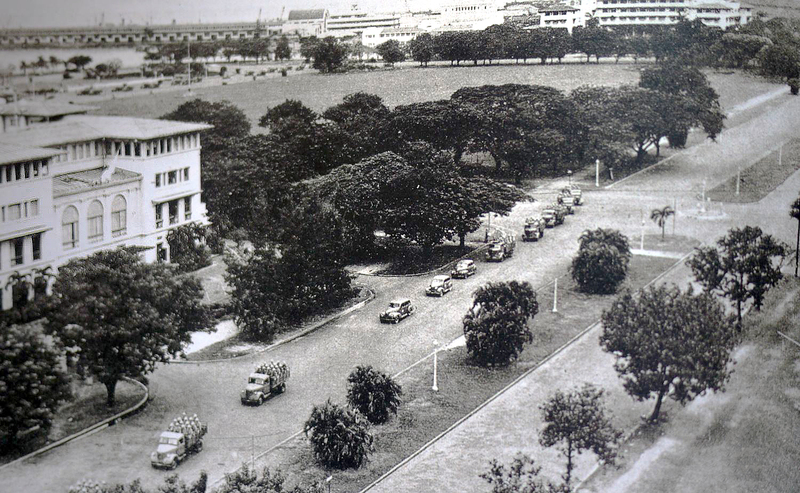 During the Battle for the liberation of Manila, the Japanese selected the Manila Hotel as one of their final stands. The hotel had been bombed once in September 1944 by Allied bombers when they were greeted by machine-gun fire from the roof. A section of the wing of the hotel on the bayside was destroyed. When the Allied forces converged on the hotel, the scene became a bitter floor-to-floor, room-to-room fight. It was then the hotel was set on fire by the Japanese. 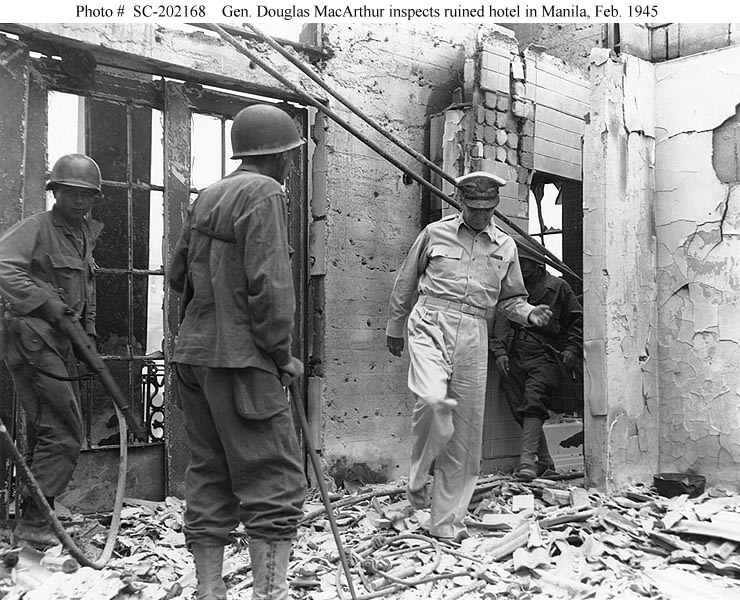 When the Battle of Manila was over, Jean MacArthur pleaded with the general to take her to their Manila Hotel penthouse hoping to find something of all the beautiful things and personal mementos they left there but all they found was five inches of deep ashes. A bomb had been placed inside their grand piano and detonated, setting the penthouse on fire. 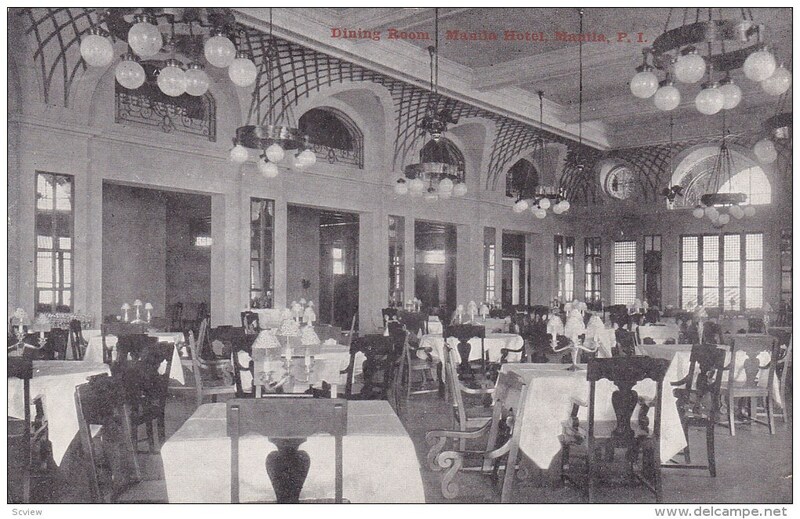 Manila Hotel after the Battle of Manila. Nothing remained of the glory that was once the showcase of Manila but the spirit of the hotel as well as the Filipino people struggled to survive and it did. Gen. Douglas MacArthur died in 1964, his wife Jean died in 2000. Both are interred at the MacArthur Memorial in Norfolk, Va.
Former President Quezon’s aide, Col. Manuel Nieto was appointed to manage the cleanup and initial restoration. Damages to the hotel amounted to ₱3M but the Board was only awarded a million for repairs. The actual work which took over two years exceeded ₱10M. Within two months, most of the debris had been cleared and some public rooms were available even though evidence of shellfire was present throughout. The annex was closed indefinitely but the hotel reopened with one wing of rooms offered at a premium. The first social event scheduled after the war was a Fil-American ball given to raise funds for rebuilding the city of Manila. It was a much needed morale booster for the city. The atmosphere was glittering and gay. People were anxious to put the last three years behind them. Money flowed freely from reconstruction funds, corruption was rampant (as usual) and the Grande Dame was losing its splendor and sheen and even more debilitating, it was plagued by theft, pilferage and political exploitation. Politicos didn’t think it necessary to pay their bills and guests stole the silverware. The government-managed Manila Hotel corporation was mired in debt and inevitable bankruptcy. It was decided to offer the hotel out to lease and eventual purchase. Fortunately, the Bayview Hotel Corporation with Mrs. Cielito Zamora as Executive VP and Manager, picked up the lease in 1954 but not without a small problem. Employees laid off due to the lease were to be granted a separate gratuity. Tirso Cruz and his orchestra members sued as they were not provided the same benefit. They lost in court having been named as individual contractors and not employees of the Manila Hotel. I guess their swansong fell a little flat. The hotel was still an epicenter of social life, adapting to new styles such as the disco fashions of the 1960-1970s. Now in the mid-1970s, the hotel faced stiff competition from newer hotels being built in the Makati area where the business district had moved. The hotel was badly in need of updating and major re-design; there was talk of tearing the Manila Hotel down rebuilding anew. Architect Leandro “Lindy” Locsin was commissioned for the renovation. 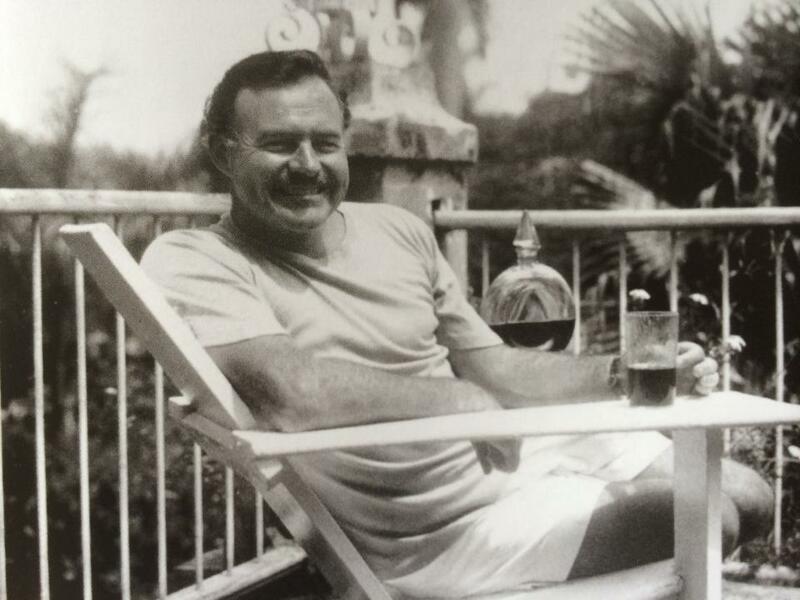 He led the way to save the original building and still created a 600-room modern hotel. The old hotel’s bayside annex was torn down. 149 rooms in the original building were remodeled into 100 modern rooms plus the addition of an 18-story tower behind the old building. 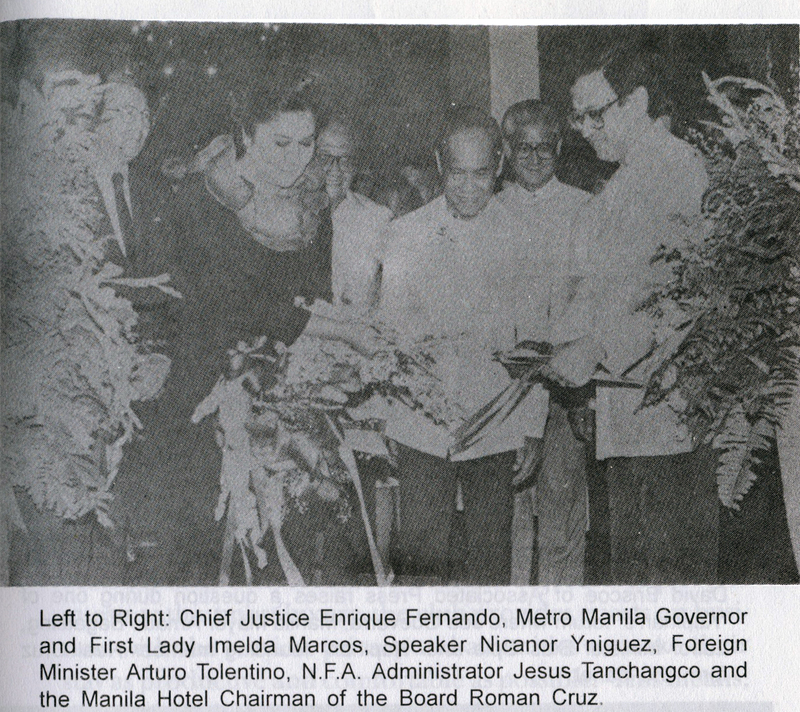 Inauguration of the “new” Manila Hotel was on September 29, 1980 with Imelda Marcos together with Manila Hotel’s Roman A. Cruz Jr. celebrating its opening. Of course the Manila Hotel has gone through iterations of management and ownership over the later years but this is where my tour of the hotel ends. It still holds a very historic and warm part for everyone, not only in the Philippines but worldwide as an icon of Filipino hospitality. I dearly hope it doesn’t go the way of so many heritage buildings in Manila that we’ve lost in recent years. 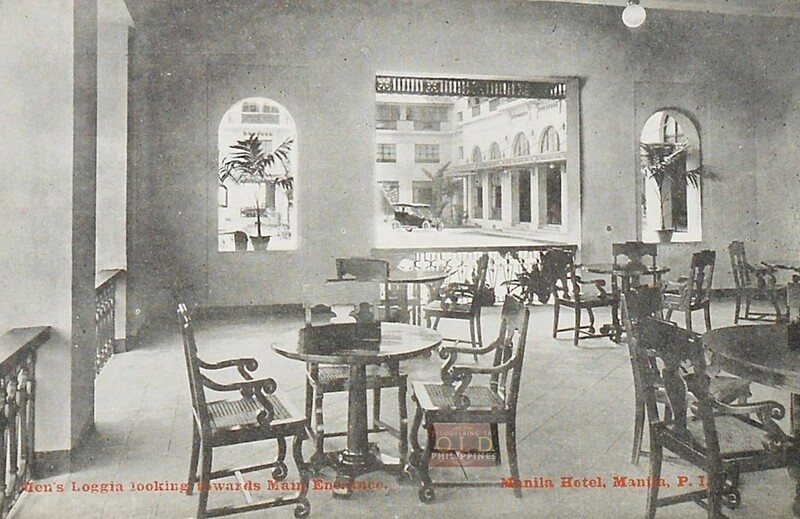 My research for this article was derived from my personal library and many online sources but I relied most heavily on Beth Day Romulo’s book “The Manila Hotel”, a wonderfully detailed history of the hotel. 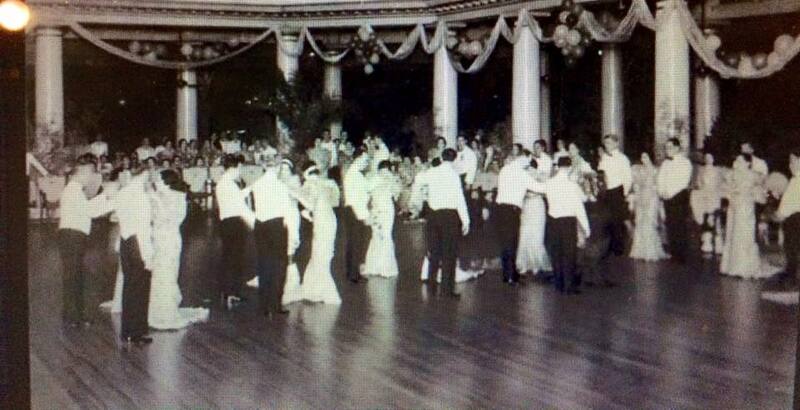 My parents were married in the Winter Garden at the Manila Hotel November 30, 1940. It was called the Winter Garden because air conditioning had just been installed. Perhaps someone could help me with some facts about my paternal grandfather, Cheri Mandelbaum, who was an architect. The story we heard is that he designed the Winter Garden and my parent’s wedding was the first one held there. Mom wore an ice-blue wedding gown to reflect the “air condition”. Another winning article. My father, Harry Rindler, worked for Mr. Zamora in Manila, and later went on to open up the Ambassador Hotel in Hong Kong which was half owned by the Zamora family. I too used to go to the Manila Hotel, swim in the pool, and always loved the gardenias around the pool. I stayed there in 1967 when I visited my Manila with my girlfriend. My love for gardenias continue to this day, as I have several bushes planted outside my family room sliding glass door. I pick them and have them floating in water in my kitchen. I also used gardenias in my hair when I used to make sales calls while I was working in the travel industry. Beautiful write-up and rich in information as always, Lou! Thanks for never giving up on our History and heritage. Very interesting read, worth your time and if you love Pinoy History. My wife and I have dinner and entertainment at the Hotel in 1985 during our annual vacation to the Philippines. It was an evening to remember and I felt very rich that I was able to take my wife at that time to enjoy the luxurious ambiance of the hotel. Another great article. Brings back so many wonderful memories. Thanks for your hard work. My wife and I spent an enjoyable three days in the late eighties at the Manila Hotel when the late Mike Cuisia was Deputy Manager and we really had a VIP treatment. The breakfast was devine, with all kinds of food from Fililpino to European. Truly a great hotel! The service was excellent and the rooms were squeaky clean with change of linen twice a day. Breakfast was my favorite meal when we were there too ! Our waiter would remember how much I loved the fresh mangoes and would bring some to our table as soon as we sat down. We also enjoyed talking to you and your lovely wife. It was a good trip. It was 1996, Lou. I remember it well. Another excellent piece. 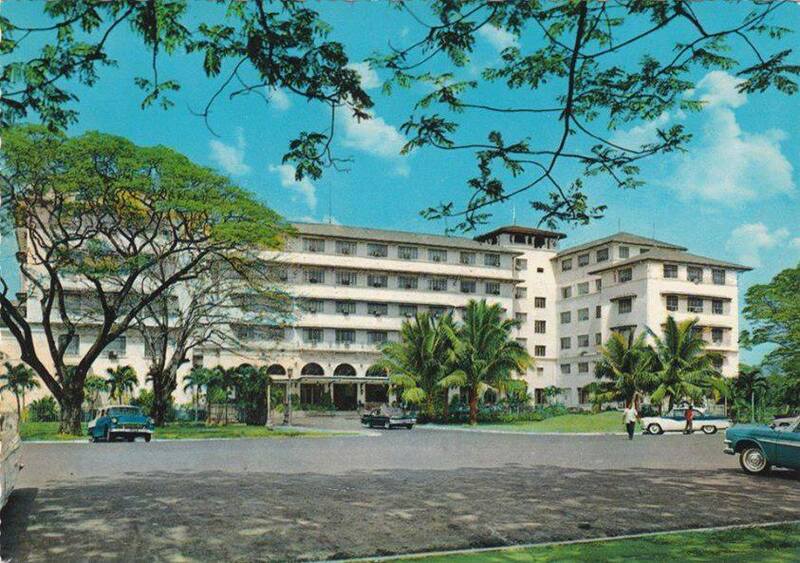 The Manila Hotel has always brought good memories. My wife, Diana and I used to enjoy dancing and listening to music in this hotel, and dining was always a total delight. Thanks for bringing back those memories and more. Another fabulous piece! The amount of history and number of photos you are able to put together is truly astounding. I’m visiting my dad this weekend, and I was excited to show him this piece. He and my mom were great fans of Lito Molina and his group The Jazz Friends when we lived in Manila in the late 1970s and early 1980s. The Jazz Friends played on Sunday at the Regent Hotel down near the bay, and my parents and other friends of theirs were often there to listen. In fact, when my parents and I visited in 1993, Lito arranged a special session for them at one of the Makati hotels. 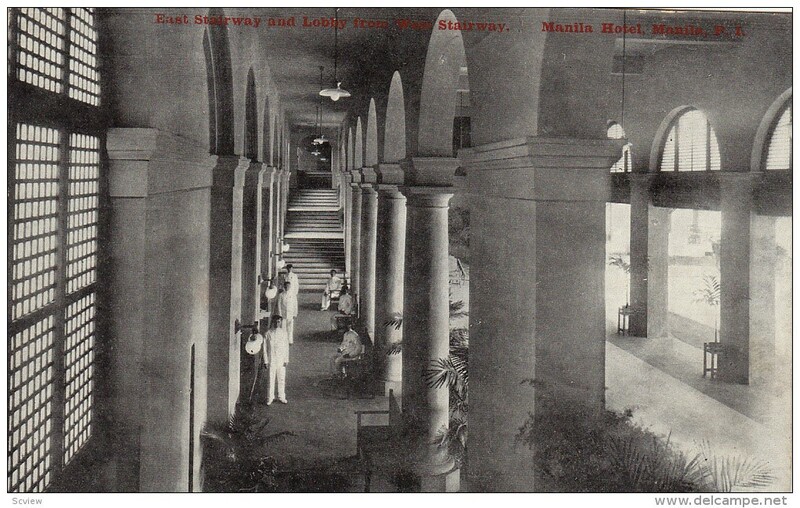 So it was great to show him the early photo of Lito–plus the Manila Hotel was a favorite place for us with all its history. I went to two proms there as well as the reception for a very fancy Marcos wedding we somehow got invited to (via Ming Ramos, who was, of course, working at school). We also looked at the piece on AS/IS, which he also really enjoyed. My dad was superintendent of IS 1976-82, but virtually all of the early history about the American School was new to both of us. The dressmaker my mom, sister, and I went to in Manila happened to live just around the corner from the Donada Campus, and it was interesting at the time to see names we knew from the Bel Air campus on the Donada Campus buildings (Heilbron, Spruance) but all the history prior to Donada was completely unknown to us. You do an incredible job with these! I’ve loved every one of them and always learn so much about this city that is still so dear to both my dad and me! Thank you!! I very much enjoyed your fascinating article. I can add a glimpse of the hotel, just a month into the dark nights of the Japanese occupation, when Paul Esmérian and Anne Balfour, two French nationals not yet interned, decided to go there for an evening out. The source is “A Free Frenchman under the Japanese”, my translation of Paul Esmérian’s wartime Manila diary, recently published by Matador in the UK but generally available worldwide through the usual channels. Thanks for this wonderful, fact-filled post! I was fortunate enough to spend the first week of September 2015 in the Manila Hotel. I was aware of some of its history, but your article added much to my knowledge. I enjoy all of your posts about Manila! Na mention po yung lolo ko sa tuhod dito na si Francisco Mendoza na naging manager ng Manila Hotel na naikukwento lang sakin ni lola corazon nung buhay pa siya.but never ko pang nakita ang picture ni Francisco Mendoza.Proud ako kasi napasama sa history natin ang lolo ko sa tuhod na nabasa ko pa dati sa sinearch ko na matalik pala silang magkaibigan ni Gen.Douglas Mcarthur. Sir check niyo kung may kilala kayo sa mga anak ni Lola Corazon Mendoza na Ignacio narin dahil sa lolo Eddie KO.Mario Ignacio papa kopo.Fructuoso Ignacio,Eduardo Ignacio Jr.Victorina Bandiola,Francisca Fukuda..Mga titot tita KO sila magkakapatid ..Parang narinig KO napo yung Delfin..
First of all, thank you for filling me in especially with the Manila Hotel. I was 6yo in 1960 when i was able to enter the Manila Hotel. My mom used to teach piano lessons to some of the commissioned officers in a place called USO ( was that also inside the Manila Hotel?) and she would take me on a tour of the Manila Hotel together with some of her piano students ( americans ) staying at the hotel. A decade later, i met my wife to be at the Jungle Bar, and Tap Room Bar of the Manila Hotel where she sang regularly with a band in the early 70s. My wife and i have been married for 38 years now. Praise God. I came upon your posthru a friend who shared it on Facebook. I just intended to go for a swift browse, but as soon as i started reading i could not let go and the hours have gone fast and i still will continue reading later. I finished with part 2 of your writing regarding the Malate area. Again, thank you for your dedicated time of sharing all these historical and wonderful update of what has been and what has become of it all. Peace be with you. God bless. I am so pleased you liked my articles. Thank you ! Another job well done! I hope someone is making arrangements for all of your hard work to be saved for the generations to come once we are all long gone. They are a true history lesson of the grand old days of Manila. Thank you for all the time and research you put into them. In the early 50s, as a child I enjoyed visiting the mini-zoo at the back, not far from a gymnasium, which had a boxing ring outside, and often used by boxers training for a coming match. Great comments and early pictures. As a teenager, I lived at the Manila Hotel during the summer of 1956 while my father was employed by one of the Soriano companies. Most pleasant “home away from home”. That 4th of July I remember walking over to the US Embassy and listening to (then) Vice President Nixon give an informal speech out in the garden area. There were still reminders of W.W.II around and, in the case of the hotel, at the pool area some of the tiles still reflected damage from gun fire. When I wanted to go downtown I usually walked over to the Luneta and hailed a jeepney. Fond memories of a country still recovering from the War just a decade earlier and before the massive development of later years. What a marvelous website. I’ve been travelling to the Philippines since 1977 when my Filipina wife and I visited on our honeymoon. Since then, I’ve had an interest in the history of the Islands. Returning in March to renew our vows. As always, a fascinating read Lou. I fell in love with Manila Hotel when a friend invited me to her wedding reception in the Champagne Room….unfortunately it was not available when my wife and I got married in December 1999 in the nearby San Agustin Church in Intramuros. Your detailed description of its history adds up to its glorious past as one of the iconic symbols Manila at its most exciting years…..Keep on writing about our beautiful city and more power to you!